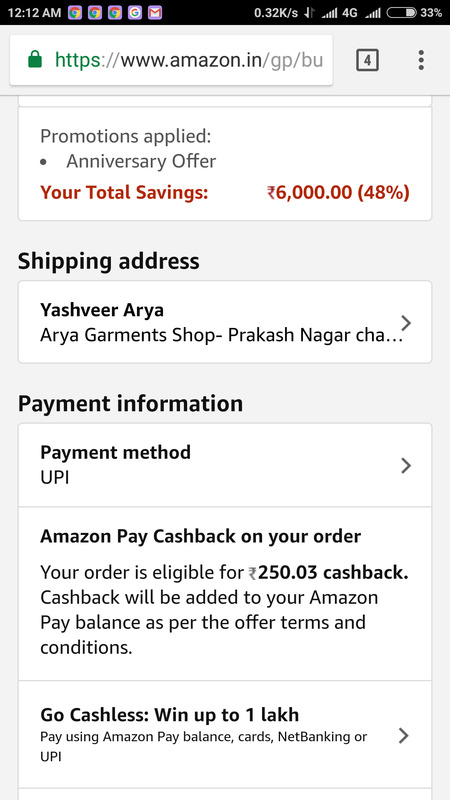 Amazon – Get Rs 250 Cashback on Purchase of Rs 1000 or more. If you are looking to Buy some Stuff for you or for Someone else, Then Here is the Best deal for you where you will get the Flat Rs 250 Cashback on purchase of Rs 1000 or more. This Offer is valid from 14th June to 17th June 2018. So Hurry up and avail this Deal !! 1) First of all, Visit Amazon Product Page Here (Valid only on Category and the products on above and below links). Note:- Cashback offer will not be mentioned on product page, But you will see the Cashback confirmation details on Page (just after select your Payment method) and before payment gateway. 1. The ‘Shop Select Amazon Exclusive Collection cashback’ offer (“Offer”) is provided and made available to you by Cloudtail on the website www.amazon.in and the mobile site and mobile application thereof (collectively, “Amazon.in”). 2. These Offer terms and conditions (“Offer Terms”) are in addition to the Amazon.in Conditions of Use & Sale and Privacy Notice to which you agree to by using Amazon.in and the terms and conditions applicable for the Gift Cards (“Gift Card Terms”) issued by QwikCilver Solutions Private Limited (“QwikCilver”). In the event of any conflict between the Conditions of Use & Sale and these Offer Terms, these Offer Terms will prevail, only for the purposes of this Offer. To the extent the Gift Card Terms are inconsistent with these Offer Terms; these Offer Terms will prevail with respect to the Offer only. 3. The Offer is valid from 14th June, 2018 21:00:01pm (IST) and end on Jun 17, 2018 at 11:59:00 p.m. (IST) (“Offer Period”), unless revoked or extended by Amazon (in its sole discretion), without any prior notice and without any liability. 4. During the Offer Period, every person who purchases any product on Amazon.in worth more than INR 1000 using any form of prepaid electronic payments (each such order hereinafter referred to as “Order” and each such person hereinafter referred to as a “Purchaser”) will be entitled to receive a INR 250 cashback (inclusive of taxes) (“Benefit”), subject to a maximum of INR 250 as Amazon Pay Balance in his/her Amazon.in account on such purchase transaction. 5. “Amazon Pay Balance” is a sum of all the balances associated with Amazon.in Gift Cards (“Gift Cards”) in your Amazon.in account and all balances added as Money as Amazon pay balance (“Money Balance”). Gift Cards are issued by Qwikcilver and are subject to the Amazon.in Gift Card Terms and Conditions available at www.amazon.in/gp/help/customer/display.html?nodeId=201522810. Money Balance is issued by Amazon and is subject to the terms and conditions available at www.amazon.in/gp/help/customer/display.html?nodeId=202123460. 6. The Benefit will be provided to the Purchasers in the form of Gift Card(s). The use and redemption of the Gift Card(s) is governed by the Gift Card Terms. 7. Notwithstanding anything above, the maximum Benefit/ Amazon Pay Balance that can be availed by a Purchaser for this promotion during the Offer Period is INR 250 per customer irrespective of number of purchases and/or the value of the Order. 8. Full payment of the transaction must be done through electronic payments. Any transaction with ‘cash on delivery’ will not be considered valid under the Offer. Can we combine it with UPI 10% cb offer? No. Because its not showing on Cashback Confirmation Page. Single order means. All Multiple products should be place at Once and the Cart Value Should be equal or exceed [Rs 1000+] excluding shipping and other charges. Agar main 4000 ka kuch kharidu or 1000 pay balance se or baki upi se payment karu to 250 Cashback milega na..? Yes.. it will work as we need to pay online only. You can confirm the Cashback confirmation message before payment. (See my 1st comment in this Post). No… You cannot combine Amazon Pay Balance and UPI, they have disabled UPI option if you select your Amazon Pay Balance. However, you can avail UPI cashback Rs.100 if you pay entire order thru UPI. Even though it displays cashback Rs.250 only, but you will get Rs.250 and Rs.100. Confirmed with Amazon CC. I’ve added 1000 to pay bal and got 100 rs cashback then i purchased prime membership with a 15rs book order & got 250 cashback so i got prime in just 649.